All over the world humans struggle to provide themselves with food, housing, and comfortable lives, while preserving the natural environment so that it can continue to sustain animals, plants, and other living things, including humans. Such struggles come into sharp focus on islands, such as Madagascar, off the southeast coast of Africa in the Indian Ocean, where resources are clearly limited and human population continues to grow. 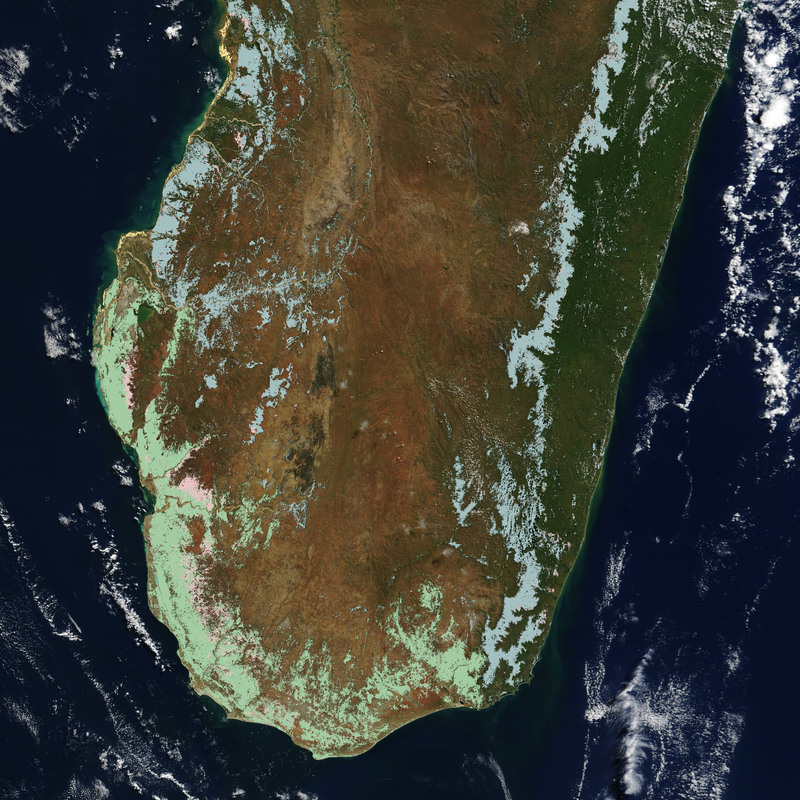 Madagascar is divided into roughly four major habitat types separated by a mountain chain running down the length of the island. Rainforest containing valuable hardwoods covers the eastern slopes of the mountains, at one time all the way to the eastern seaboard; savanna woodlands and grasslands predominate around remnant patches of what was once an enormous dry deciduous forest along the west side of the island. Grasslands, typical of the high plateau, now dominate the island’s scenery; and spiny (desert) forest is found at the southern end of the island. 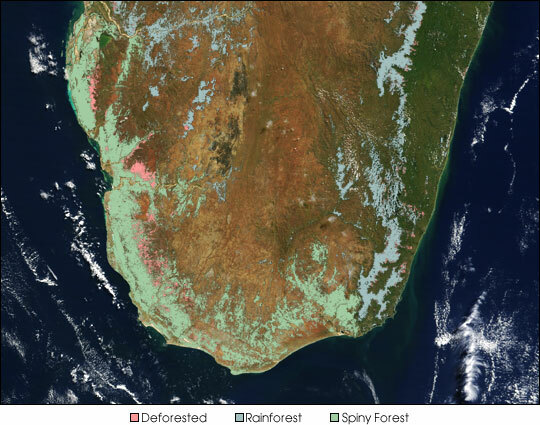 The image above shows a Moderate Resolution Imaging Spectroradiometer (MODIS) image of southern Madagascar with a color-coded overlay showing the location of two important ecosystems on the island—rainforest (light blue) and spiny forest (light green)—as well as areas deforested in the 1990s (pink). Based on observations from NASA’s Landsat satellite and verified through aerial digital photography and videography, the deforestation maps were produced as a joint project by the by the Center for Applied Biodiversity Science at Conservation International, the Center for Biodiversity Conservation in Madagascar, and NASA Goddard Space Flight Center. Deforestation is most apparent in the spiny forest region, which supports rare mammals like lemurs and fossas, despite the fact that it grows in near-desert conditions. Madagascar’s isolation from the African continent for millions of years has preserved and produced thousands of species of plants and animals found nowhere else on Earth. Of the ten thousand species of plants catalogued on the island—and the list is still growing—8,000 of them are endemic (unique to the area). The density of endemic plants is such that some individual mountain tops have 150-200 endemic plants. This large number of unique species makes deforestation a great threat to global biodiversity. Deforestation on the island began with colonization in the late 1800s, but prior to 1950, the inroads into the island’s forest ecosystems were generally small. As more and more of the island’s best farmland was brought into export coffee production, the residents of the island have had to clear more forest for their personal agricultural needs. With a population of 14 million people and growing, Madagascar is under enormous pressure to meets the needs of its people and still preserve the natural environment. Scientists fear the rapid, additional clearing of the island’s forests for cash crops such as cotton and tobacco endangers the habitat of the many plant and animal species unique to the island while at the same time creating soil erosion problems that impact water quality and the future productivity of agricultural lands. Base image courtesy Jeff Schmaltz, MODIS Rapid Response Team, NASA GSFC. Image overlay by Ned Gardiner, American Museum of Natural History, based on data provided by Marc Steininger, Conservation International. For additional information or digital data, contact Marc Steininger.